A child needs the love and care of both the parents. When Eminem was 6 months old, Marshall Bruce Mathers Jr.,his father divorced Deborah R. Nelson-Mathers, his mother. During his childhood he made many attempts to contact his father through letters. However, each one of them returned unread. Being a single parent, his mother could barely make both ends meet. She did not survive at a job more than 6-7 months. Due to this his life shuttled between Missouri and Michigan. In that case, he had to change schools twice or thrice yearly. Therefore, he never made great friends. Henceforth, he became shy and introvert. He did rap about DeAngelo Bailey in the song “Brain Damage”. DeAngelo was accused of beating him to an extent which caused Eminem brain hemorrhage. He was in ‘coma’ for several months. Later DeAngelo sued him with $1 million lawsuit for making up wrong stories about him. He would have died in 2006 if a delay of 10 minutes had occurred on the way to hospital. Also to avoid the stress caused by his disturbing married life followed by divorce in 2000, he turned to the soothing effects of drugs and alcohol. He remarried Mathers in 2006 but divorced again several months later. It took him almost 20 painkillers per day to escape from the depression and to recover he entered rehab. 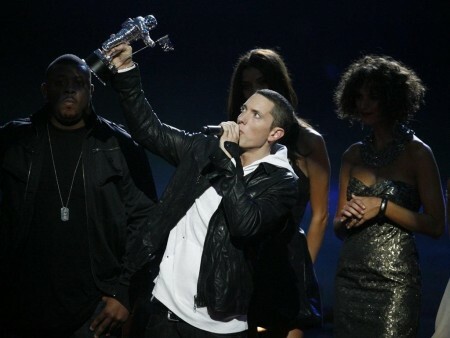 Later he marked his return in 2008 with an album Relapse. Life tested him severely but he did not break down. Correspondingly, he has 1 Academy award, 11 Grammy awards, 10 MTV Europe Music and 9 People’s Choice awards coupled with a lot of awards in his name.